But we'll back Oscar and Frosty, and they did the job for us late last year. They're both capable defenders. ATHLETIC Melbourne defender Sam Frost is likely to get the nod to replace the suspended Steven May in round one, vice-captain Max Gawn has declared. May will have to wait an extra week to make his debut in the red and blue after being suspended for one match for engaging in rough conduct on Brisbane's Jarrod Berry in the Demons' final JLT Community Series tune-up at Casey Fields last Saturday. Gawn has backed Oscar McDonald to hold down the No.1 key defensive position against Port Adelaide at the MCG, with Frost ahead of second-year backman Harrison Petty to step up in the absence of the former Sun. "Because (May) hasn't played with us, it's almost like no one's replacing him," Gawn said with a laugh. "It will be Oscar and Frosty, I presume. Unless Port Adelaide line up small (with a small forward line) it might just be Oscar and (potential debutant) Marty Hore or someone like that. "But we'll back Oscar and Frosty, and they did the job for us late last year. They're both capable defenders." Frost, who was a key part of Melbourne's defensive mix in the back half of last season and during the finals series, did not feature in the JLT Community Series game against the Lions. Petty, who played just one senior game last season in a round 15 loss to St Kilda, also sat out the pre-season match as the Demons decided to field a squad of 23 players. "There's the experience of Sam and what he brings and his intensity around the contest and then Harry brings that youth, he's a good intercept mark as well which we saw in Shepparton. "I think Oscar will be the one that we do see, so it will be interesting to see what happens there." The Demons tinkered with their line-up across the pre-season but still gave up an average of 108.5 points in their two JLT Series games. 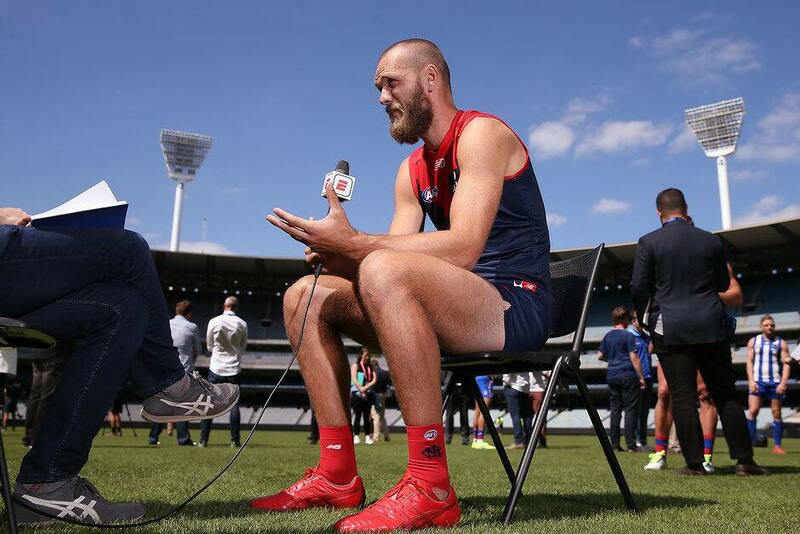 Standing in for co-skippers Nathan Jones and Jack Viney at Captains Day, Gawn said the Demons leaking so many points was a slightly worrying trend to emerge out of the pre-season. "People look at JLT differently, and people looking externally might say, 'Oh, it's just JLT'. But, look, you still want to be playing some really good footy in the pre-season," Gawn said. "To let both teams score highly means we do have stuff to work on defensively, and to not play our brand over two weeks is not something that we don't want to be doing. "We looked through a couple of bits of vision and hopefully we'll be better in that area in round one."